There is a diversity of structures in which plants store buds for resprout after disturbance. Some trees resprout from aboveground bud (e.g., epicormic resprouting; Pausas & Keeley 2017 [doi | pdf], but many plants resprouts from basal (or belowground) buds. The aim of this database is to provide examples of structures that support belowground bud banks (BBBs) of plants in different ecosystems and regions of the world. The emphasis is on plants indigenous to fire-prone ecosystems (but not exclusively). The database is largely based on published work, although personal observations of the authors (and collaborators) are also included. However, there is a lot of confusion in the literature about the terminology and definitions of the different BBBs. 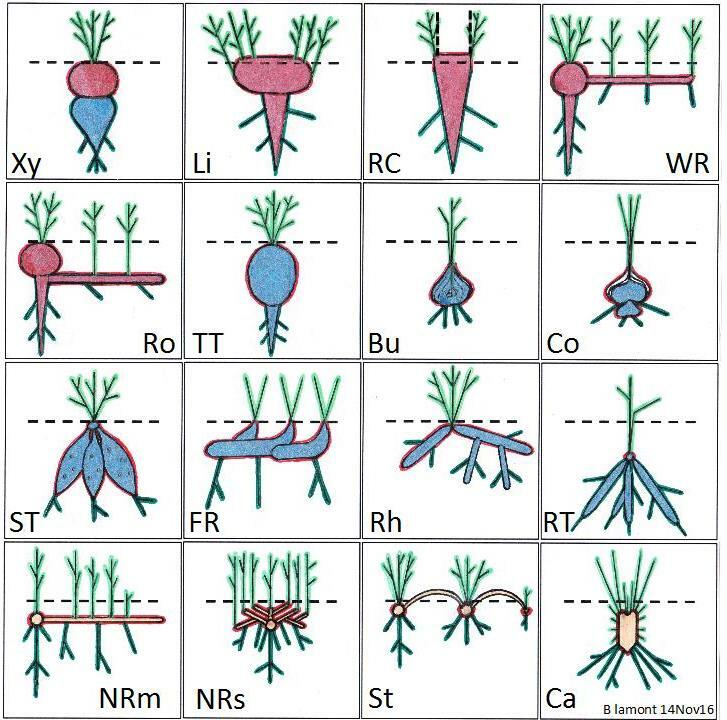 For instance, there are authors who call "lignotuberous" to any basal resprouter without checking whether the plant actually has a lignotuber or another type of BBB; and various authors use the term rhizome and sobole in different ways. This database reflects our interpretations based on our literature review, and we have provided, for each species, the references on which we have based our interpretation, although the term used in the reference may differ from that accepted in the database. Where we are unsure of the BBB, we use a question mark (?). We discarded references that mentioned a BBB, but the actual BBB was unclear to us. We also avoided including generalizations of some species groups; for instance, most terrestrial orchids have adventitious root tubers, but we only included those for which we have specific references. Thus, the emphasis is on data quality rather than on quantity. Diagrams of belowground bud bank structures (see the orignal paper for details). · Taxon: taxonomic binomial name. In general, we used accepted names following the Taxonomic Name Resolution Service (Boyle et al., 2013). For Brazil, we used a local flora (Brazilian Flora, 2020), and for Western Australia the https://florabase.dpaw.wa.gov.au. · BBB: belowground bud bank organ; 15 types, see table below for the categories considered and a short definition; for more details see the main text, Box 1, Fig. 1 and Notes S2 of the paper (above). Note that some species may have several BBBs. A question mark (?) after the name of the organ indicates that we are unsure (e.g. roots?). Root crown Root-shoot transition, typically not thickened. (Thickened) Root crown Root-shoot transition, often thickened after multiple resprouting events (i.e., burls of secondary origin). Thickened root crowns are often termed ‘lignotubers’ by many authors, but theses swellings are not present at a young age. Lignotuber Basal woody burl (at the root-shoot transition) of shrubs, mallees and small trees much wider than the taproot. They appear when young (burls of ontogenetic origin) and develop at the cotyledonary axils. Xylopodium Basal woody burl of some subshrubs that originates from the hypocotyl or the upper part of the main root provided not swollen, or from both, and can also include the base of the stems. Only marginally wider than the taproot. Basal burl Basal woody burl of unknown origin. It could refer to a lignotuber, a xylopodium or to enlarged thickened root crown, but we do not have enough information to know which. · References: Code for the references that are used to support the BBB type. Full references are given in the reference file. · Biome: Biogeographical biome where the species occurs, based on Olson et al. (2001). The 14 biomes are termed as follows: TrMoist (tropical & subtropical moist broadleaved forests), TrDry (tropical & subtropical dry broadleaved forests), TrConif (tropical & subtropical coniferous forests), TempBroad (temperate broadleaved & mixed forests), TempConif (temperate conifer forests), Taiga (boreal forests), TrGrass (tropical & subtropical grasslands, savannas & shrublands), TempGrass (temperate grasslands, savannas & shrublands), FlGrass (flooded grasslands & savannas), MontGrass (montane grasslands & shrublands), Tundra, Med (mediterranean forests, woodlands & scrub), Desert (deserts & xeric shrublands), Mangrove, several. This is indicative only, and it may be based on details in the references or from other sources; some species may occur in other biomes and this is not fully accounted for here; this column does not aim to be comprehensive but indicative. · Realm: Biogeographic realm as follows: Afrotropic, Antarctic, Australasia, Indo-Malay, Nearctic, Neotropic, Oceania, Palearctic, and Cosmopolitan. · Comments: some comments are included here. Boyle B, Hopkins N, Lu Z, Raygoza Garay JA, Mozzherin D, Rees T, Matasci N, Narro M, Piel W, Mckay S, Lowry S, Freeland C, Peet R, Enquist B. 2013. The taxonomic name resolution service: an online tool for automated standardization of plant names. BMC Bioinformatics 14: 16. Brazilian Flora 2020. Rio de Janeiro Botanical Garden. http://floradobrasil.jbrj.gov.br/. Accessed February 2017. Klimešová J, Danihelka J, Chrtek J, de Bello F, Herben T. 2017. CLO-PLA: a database of clonal and bud-bank traits of the Central European flora. Ecology 98: 1179-1179. Olson M, Dinerstein E, Wikramanayake E, Burgess N, Powell G, Underwood E, DïAmico J, Itoua I, Strand H, Morrison J, Loucks C, Allnut T, Ricketts T, Kura Y, Lamoreux J, Wettengel W, Hedao P, Kassem K. 2001. Terrestrial ecoregions of the world: a new map of life on earth. Bioscience 51: 933-938.